Review: This is a good read. Andrew Street tells a good story – with loads of humour along the way. But you must be warned, while it is a story told well and in an entertaining fashion, it could be a little depressing if you thought that Malcolm Turnbull was to be any good as Prime Minister. 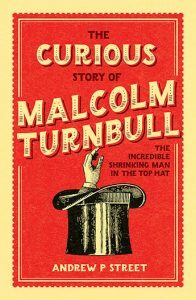 The Turnbull story as told by Andrew Street is one about a leader without any vision. He is committed to himself and doing whatever it takes and saying whatever it takes to be the Prime Minister. None of the politicians around him do well out of this book. You will have heard much of the story through the daily news but Andrew manages to join all the dots and provide a portrait of this bloke and his ‘friends’.